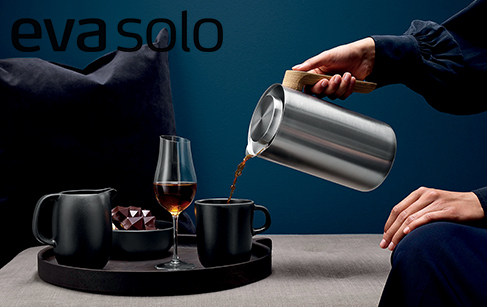 Eva Solo creates exclusive, Danish-designed furnishing accessories and kitchenware characterised by aesthetic appeal, functionality and high quality. Tools which are a pleasure to look at, use and own. The history of the company dates as far back as 1913, but the Eva brand had its major breakthrough in 1952 with a bread and meat slicing machine that went on to become a design classic. The first of many. Today, the products are divided into several collections which are marketed worldwide. But the essence is still the same: aesthetics, functionality and quality. Eva Solo imparts exclusive Danish design to everyday objects in the home. Simplicity, distinct lines and a high degree of functionality characterise the products in the collection. The series is divided into the following categories: cooking, serving, living, bath and outdoor. All in all, an extensive selection of tools and utensils so you can surround yourself with outstanding design throughout your home.